The Management Team of the Fatima Center sadly announces the death of Father Nicholas Gruner, who passed away suddenly this evening. Father died at his office, working to his last breath on the goals to which he dedicated his 38 years in the priesthood — the promotion of the Message of Fatima, especially the release of The Full Third Secret and the Consecration of Russia by the Pope together with all the Bishop of the world to Our Lady's Immaculate Heart. Father was born on May 4, 1942 in Montreal, Quebec. He graduated from McGill University with a degree in Commerce and earned post-graduate degrees in Sacred Theology from the Pontifical University of St. Thomas Aquinas (The Angelicum) in Rome. 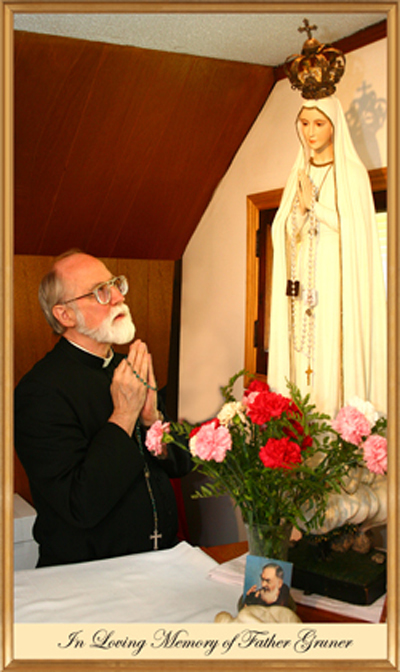 He was ordained to the Holy Priesthood in Avellino, Italy on August 22, 1976 and, in 1978, launched The Fatima Crusader - a magazine dedicated to Our Lady of Fatima. Over the next 37 years, he and his apostolate, The Fatima Center, promoted the complete Fatima message worldwide through books and other literature, conferences, Rosary rallies, television programs, websites, and the distribution of millions of Rosaries and scapulars. He worked to his last breath to try to convince the Holy Father to release the entire Third Secret of Fatima and to consecrate Russia to the Immaculate Heart of Mary. Father was a kind-hearted person with a warm laugh, who will be greatly missed by his family, the staff of the Fatima Center, and the countless souls all over the world whom he touched and whose faith he helped deepen.